When Viktor Moskalenko�s 'The Flexible French' appeared in 2008, it caused a sensation. It was hailed by reviewers from all over the world as eye-opening, full of new ideas, easy to read, sparkling, and inspirational. Time has not stood still, and the popular French Defence has seen a lot of new theoretical developments, not few of which were inspired by 'The Flexible French'. Seven years after its publication, Viktor Moskalenko has decided to fully revise, update and extend his modern classic. The Even More Flexible French has largely the same structure as its predecessor, but the content is fully up-to-date on the latest theory. There are twelve new chapters on lines that have grown in importance, 28 more games, and throughout Moskalenko has found hundreds of improvements, alternatives, new ideas and fresh weapons that will delight and surprise the reader. 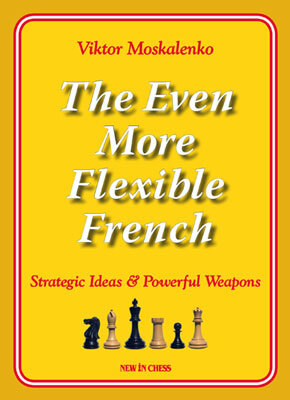 The book contains a more or less complete French repertoire for Black. Yet Moskalenko also presents quite a few weapons and opportunities for White. The Ukrainian Grandmaster�s analysis is, as before, high-level, his touch has remained light and fresh.